So, on the 16th and 29th of every month (because THIS year EVERY month has at least 29 days) we'll be doing some sort of special Sweet 16 Countdown. The 16 Biggest Rolling Stones Hits of the '60's. Other '60's hits of note: "Not Fade Away", "Tell Me", "It's All Over Now", "Play With Fire", "Let's Spend The Night Together", "Street Fighting Man"
1958 - Elvis Presley records "Hard Headed Woman"
1967 - The Buckinghams begin recording "Don't You Care"
1971- Chase records "Get It On"
1988 - Davy Jones guests on ABC-TV's "Sledge Hammer"
Like this kind of stuff??? Then be sure to join us tomorrow for our first SWEET 16 salute of 2016! The guy was clearly well loved in all circles. I swear I've heard more Bowie music in the past 48 hours than I have in the last five years combined!!! This morning I listened all the way through the long version of "Fame" ... then, when it was over, changed the channel to find them ALSO playing "Fame" ... so, having just heard it, switched the channel again to find that "Fame" was also playing on THAT station!!! Don't really need to hear it THAT many times in ten minutes!!! On the way home I heard "Modern Love", "Golden Years" and "Young Americans" all within a 15 minute timespan. Bowie also held 19 of the Top 20 Spots on Amazon.com's "Vintage Artist" Best-Sellers list, including the Top 12 positions. He apparently fought cancer for the past eighteen months without disclosing his condition publicly. (And I had completely forgotten that he had a heart attack a few years ago, too.) Still, an unexpected surprise ... and certainly not in a good way. I bought "This Time" at that time ... 1961. So sorry to hear of the passing of David Bowie, but what touched me more was the passing of Troy Shondell. In my Top Ten of favorite songs, "This Time" is in that bunch. It was a low budget, small record label, but it had a special sound with the piano and lyrics that reached all us teens at that time! I watched 'You Tube' with Troy singing his national hit and I have the original Goldcrest record in my juke box. Thank you, Troy "Gary Wayne Shelton" Shondell for "This Time". ps I have a Liberty record of Troy's called "Tears of an Angel". How did it do on Billboard? When in doubt ask the master!! Thanks for rerunning the Bobby Darin Series again. I agree with you in reference to Michael Buble owing more to Bobby Darin then Sinatra . I always thought the biggest compliment Sinatra ever paid Bobby Darin was the fact that he never attempted to record “Beyond The Sea”. I recall the early Napster years and the fact that a great many number of people requested a copy of Sinatra singing “Beyond The Sea”. As a matter of fact if you entered “Beyond The Sea” by Frank Sinatra back then, there were hundreds of entries giving Frank Sinatra credit for recording this song. I’m a huge Bobby Darin fan and the only Darin song I never really cared for was “That’s All”. I would much rather of heard him do a cover of this song as a beautiful slow ballad, which he would have been more then capable of doing. “Rainin’ “ is a great hidden gem. My favorite hidden Darin gem has to be “A Nightingale Sang In Berkeley Square”. I’ve heard all the greats do their rendition but Bobby’s stands out as the best, even better then Frank’s and I’m the biggest Sinatra fan in this world. In the Darin series they mention the fact that he sometimes needed oxygen during performances at his live shows. Bobby does a rendition of the great standard “Once Upon A Time” on one of his TV Shows. The oxygen reference makes me think of this show. Darin tells his conductor Roger to start the intro again while he catches his breath and then says again “once more please”. Bobby then sings this song and knocks it out the park. “Aint there one damn song that can make me breakdown and cry”. Yes, listen to Bobby Darin rendition of “Once Upon A Time” and I’m sure it will do the trick. A Happy and Healthy New Year To You And Yours, Kent! 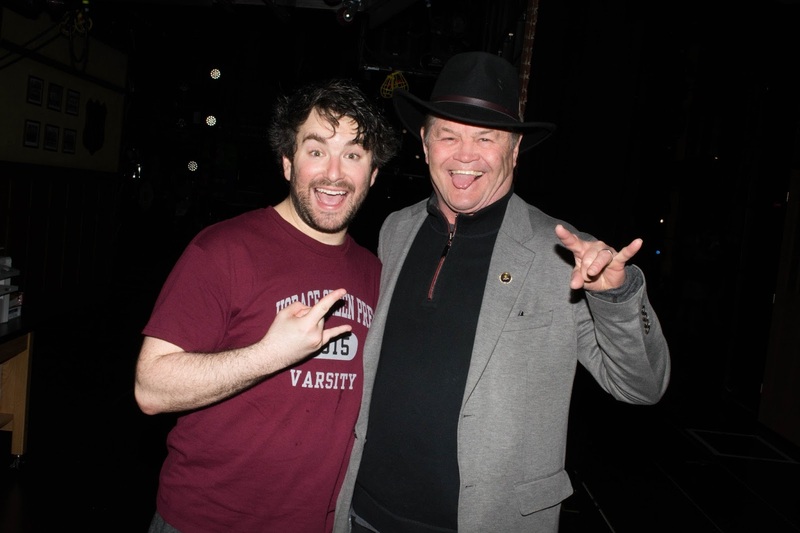 Micky Dolenz attended Broadway's School of Rock last week while in New York for his series of "In Discussions with Peter Noone"
Everything you ever wanted to know about "Runaround Sue." When my producer Jimmy Wisner and I returned from a U.K. tour supporting our 1978 success, "Hello, This Is Joannie", Spring Records told us that they'd decided to make an R&B artist out of me. When we said "NO!, they released us from our contract, and Jimmy and I were in Shock City! So we ran back to Nashville and recorded and released "Hangin' Out and Hangin' In" on Jimmy's label, Cinnamon Records. But we were dreamers, and the record crashed. It shoulda been a hit. PS Thanks to Lee Douglas for getting Peter Alden to record a version of "After The Hurricane", my last "Shoulda Been A Hit" selection. In light of the box office success of David O. Russell’s JOY we wanted to remind you that ABKCO just released the Music From the Motion Picture JOY on CD this week; it was digitally released just before the film opened on Christmas day. Rodrigo Perez, writing for IndieWire’s “The Playlist,” cited music as a key component of the film: "Music also plays a major role in “Joy,” both from a score perspective — via the orchestral work of David Campbell (Beck's arranger father) and the guitar drones of West Dylan Thordson — and from the vibrant soundtrack that practically drives the film." The newest film written and directed by David O. Russell (Silver Linings Playbook, American Hustle, The Fighter), starring Jennifer Lawrence, Robert De Niro and Bradley Cooper includes a remarkable soundtrack featuring the music of Cream, the Rolling Stones, the Bee Gees, Ella Fitzgerald and more. JOY is the wild story of a family across four generations centered on the girl who becomes the woman who founds a business dynasty and becomes a matriarch in her own right. Betrayal, treachery, the loss of innocence and the scars of love, pave the road in this intense emotional and human comedy about becoming a true boss of family and enterprise facing a world of unforgiving commerce. Allies become adversaries and adversaries become allies, both inside and outside the family, as Joy’s inner life and fierce imagination carry her through the storm she faces. Jennifer Lawrence stars, with Robert De Niro, Bradley Cooper, Edgar Ramirez, Isabella Rossellini, Diane Ladd, Virginia Madsen, Elisabeth Röhm and Dascha Polanco. Like David O. Russell’s previous films, JOY defies genre to tell a story of family, loyalty, and love. Lawrence just won a Golden Globe (Best Actress in a Motion Picture, Musical or Comedy) for her role in JOY. In addition to an original score provided by West Dylan Thordson and David Campbell, with additional music by Blake Mills, Music From the Motion Picture JOY contains a swath of timeless songs, ranging stylistically from Latin jazz to hard bop to rock and roll. The collection is bookended by two versions of “I Feel Free” – the original, which was an early hit for power trio (Eric Clapton, Jack Bruce, Ginger Baker) Cream, and a brand new rendition performed by Alabama Shakes vocalist Brittany Howard. Other significant tracks include “Stray Cat Blues,” from the Rolling Stones’ acclaimed 1968 album Beggars Banquet, and “Sleigh Ride” by the Ronettes, which originally appeared on Phil Spector’s A Christmas Gift for You, considered by many to be the quintessential Christmas album. The title track from Lee Morgan’s landmark 1964 album The Sidewinder is another JOY standout. Story and song are intertwined throughout JOY, and having all of the crucial tracks featured in the film represented in one package is an uncommon gift. Music supervisor Susan Jacobs, who also worked with David O. Russell on American Hustle and Silver Linings Playbook, meticulously chose a collection of songs used to carry forth the themes that serve as threads throughout the film. Jennifer Lawrence has won her third Golden Globe. This one is for her title role in David O. Russell’s JOY. ABKCO just released Music From The Motion Picture Joy on which Ms. Lawrence is heard singing a duet with co-star Edgar Ramirez of “Something Stupid” which was, of course, a huge hit for the father and daughter team of Frank and Nancy Sinatra a scant 49 years ago. Little known fact: “Something Stupid” was written by the late Carson Parks, older brother of Van Dyke Parks. And yeah, you're right ... Robert Stigwood helped guide the careers of the BeeGees and Cream. PS - Have you stopped posting radio station surveys? As you know, it’s my favorite feature in FH but haven’t seen anything since before NYE. (Boston, MA)-- WGBH, the largest producer of content for public television, and Reelin’ In The Years Productions, the world’s premier footage source for musical artists and entertainers, today announced an exclusive licensing representation deal for WGBH’s music-related footage. The deal will include more than four decades of material produced by WGBH between 1968 and 1995, much of which has not been seen since its original broadcast. The footage is part of the WGBH Media Library and Archives and will be made available through Reelin’ In The Years Productions (RITY). Since its first television broadcast in 1955, WGBH has been the source of hundreds of award-winning news, documentary and drama programs, many of them featuring popular music. Perhaps best known is the James Brown concert at the Boston Garden in 1968, the day after Dr. Marin Luther King, Jr. was killed. WGBH filmed and broadcast the three-hour performance live at the request of Boston Mayor Kevin White in the hope of keeping residents at home and the city calm. It is credited with helping prevent riots which other cities were experiencing. Other notable performances that will now be available through RITY, feature soul music artists who appeared live on WGBH’s public affairs TV series Say Brother (now Basic Black), including Gladys Knight & The Pips, David Ruffin, Earth, Wind & Fire, Carla Thomas, Curtis Mayfield & The Impressions, Smokey Robinson, Sly & The Family Stone, Isley Brothers and The Parliaments (featuring the earliest known footage of George Clinton). Other unique programs in the archive feature performances and interviews with artists such as James Taylor, Buddy Guy, Stevie Wonder, Diana Ross, Big Mama Thornton, Taj Mahal, Bobby Blue Bland, George Thorogood, New Edition, Nancy Wilson, Eartha Kitt, B.B. King, J. Geils Band, Frank Zappa, and Tony Bennett. In 1993, WGBH produced, in association with the BBC, a 10-part documentary mini-series series called Rock & Roll which traced the history and evolution of rock and roll music, from its rhythm and blues, country, gospel and jazz roots in the early 1950s, through the advent of folk, rock, soul, heavy metal, glam, funk, punk, and reggae, to the emergence of rap in the 1980s. WGBH saved and preserved all 80 of the raw interviews they filmed (ranging from 45-90 minutes in length). The archive contains a “who’s who” of notable artists being interviewed including songwriters and producers who rarely sat down for interviews. Artists include Little Richard, Ike Turner, Scotty Moore & DJ Fontana, Ray Charles, Bo Diddley, George Clinton, Wilson Pickett, Robbie Robertson, Jerry Lee Lewis and producers such as Berry Gordy, Jerry Wexler, Lieber & Stoller, Rick Hall, George Martin, Gamble & Huff, Phil & Marshall Chess, Tom Dowd and Jeff Barry. Sadly, many of these great artists are no longer alive, but thanks to this archive the stories of their significant contribution to the history of popular music can be seen and heard. RITY has begun the process of cataloguing the WGBH music footage and making it available for clips to be used in documentary productions. I want to be honest, like that guy in Vegas who said he'd spend his winning on Cocaine and Hookers. You guys don't want me to win. I'm going to use my winnings to buy WCBS - FM ... fire all you guys and go back to the old days. Hire Harry Harrison or Herb Oscar Anderson, haven't made up my mind. (Sorry Scott ). Bring back Cousin Bruce, Bobby Jay anf Norm N. Nite. Spend some of my money to find Bob Shannon and bring him back. I might even become a Disc Jockey myself and give myself a show. I expect all of you to be rooting against my winning. I don't blame you, I'd be doing the same thing . The old man (95 years old) around the corner from me died. Just once I wanted to get a death notice to you before Ron Smith ... even if I have to resort to cheating to do it. LoL! Glam-Rocker David Bowie passed away on Sunday, January 10th, after a battle of cancer. Ironically, he had just celebrated his 69th birthday on Friday, the 8th (also Elvis' birthday) and, the day before had released a new video of his new song called "Lazarus" from his brand new album "Blackstar". Born David Jones on January 8, 1947, he ultimately had to change his name when his musical career began to take off in the mid-to-late '60's so as not to be confused with that OTHER guy named Davy Jones of The Monkees, who were topping the charts worldwide at the time. Along the way, Bowie became known as his counterpart, Ziggy Stardust, as he helped to lead the Glam Rock revolution. By the '80's, he was scoring more of his hits in the techno-dance vein. He also did a bit of acting for which he was also highly acclaimed. Biggest hits include Space Oddity (#10, 1973); "Changes" (#28,1975); "Young Americans" (#20, 1975); "Fame", which featured John Lennon (as Dr. Winston O'Boogie") on guitar and backing vocals ... Lennon also helped write Bowie's #1 Hit (#1, 1975); "Golden Years (#10, 1976); "Under Pressure", his duet with Queen (#22,1982); "Let's Dance" (#1, 1983); "China Girl" (#9, 1983); "Modern Love" (#14, 1983); "Blue Jean" (#5, 1984); "This Is Not America" with The Pat Metheny Group (#24, 1985) and the remake of "Dancing In The Street" with Mick Jagger (#7, 1985). Jagger wrote The Rolling Stones' #1 Hit "Angie" about David Bowie's first wife ... and since 1992 he's been married to world famous model Iman. Bowie also produced albums for artists like Lou Reed, Iggy Pop and the Stooges and Mott The Hoople, for whom he wrote their biggest hit "All The Young Dudes". Wow, didn't think I'd be writing about this for several years at least. Grew up with Bowie as Ziggy Stardust, Aladdin Sane and the Thin White Duke. Am heartbroken, maybe more then Davy Jones (I know ... coming from me ... ) He was truly a brilliant, visionary being. His life force and originality will be missed in this world of conformity and soul-numbing sameness. He managed to say goodbye without all of us realizing it (I sort of did, though - lots of rumours about his health after "The Next Day"). Still doesn't make the pain go away. Time to pull out some classic Bowie, on film and on vinyl and CD. Major Tom is free from his body capsule, and is now floating in the ether. Hope he knew what he meant to me, and to all his fans old and new. He was the ultimate Space Commander, and I was (and always will be) an eager Cadet, ready to follow him into whatever sonic / visual space he wanted to go to. Saw him with Nine Inch Nails at the newly completed Rose Garden in Portland, OR - the first concert there after being completed. What a way to baptize a place! Ziggy played ... guitarrrrrrrrrrrrrrrrrrrr!!!!!!!!!!!!!!!!!! R.I.P. Truly blew me away today when I heard it on the news when I woke up. I had never heard he was sick or anything! I never cared much for his outfits and acting and bizarre lifestyle, but his music was for the most part, great! The 80's stuff was popular and OK, but it was "Space Oddity" that is my fave (long version). Here in the US, the short edit 45 version came out in 69 and failed miserably, yet became huge in 73 and was one of my top 10 records for the year on my personal charts. Today, he is often relegated on US classic rock to sharing billing with Queen on "Under Pressure" and not even "Space Oddity" gets airplay. If anything, "Suffragette City" gets any or all of his airplay here. Besides the hits "Fame" and "Oddity", the 45s that also sit in my fave 45s boxes are "Changes" and the 45 version of "Rebel Rebel" which is much punchier than the "Diamond Dogs" version, IMO. Sad to hear of his loss to the music world. Sad death of David Bowie reminded me of his arrest here in Rochester, NY, in March of 1976 for possession (1/2 pound of grass). He had performed here earlier in the evening. Among the other three arrested in Bowie's suite at the Americana hotel was Iggy Pop (as James Osterberg). Bowie was booked under his actual name of David Jones. 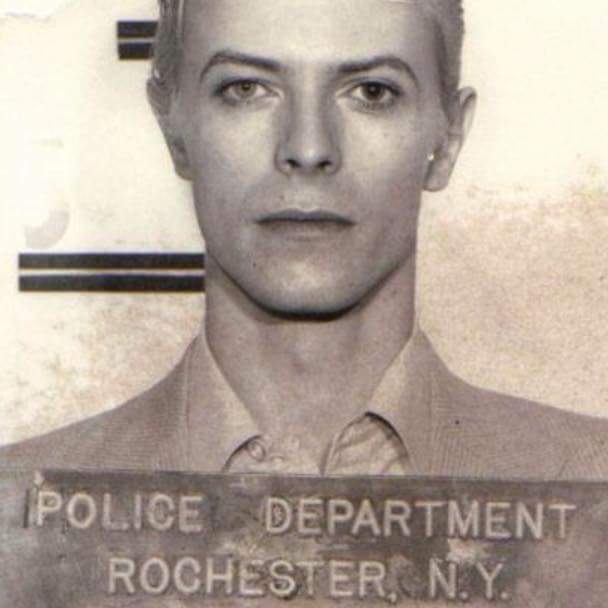 After appearances in other cities over the next four days Bowie returned for his arraignment and said that the Rochester Police were very courteous and gentle and were just super. Ironically, the Rochester lawyer who represented Bowie later went to prison for racketeering. PS - Might be the best mug shot ever! Might be a little bit late with this bit of information but haven’t seen it posted on your site when I sent to you. Did you know you that Troy Shondell passed away the other day? "This Time" was a #1 Hit here in Chicago. Story goes that budding musicians Jim Peterik and Tommy James each like Shondell's name so much they named their bands after them. Chicago's Shondells became The Ides Of March after Michigan's Tommy James and the Shondells rose to national fame with their #1 Record "Hanky Panky". Troy Shondell (born Gary Wayne Schelton) died Thursday (January 7) in a nursing home in Picayune, Mississippi. He was 76. The cause of death was complications of Alzheimer's and Parkinson's Diseases. Born in Fort Wayne, Indiana, he attended Valparaiso University in Valaparaiso, Indiana, and was signed to Mercury / Smash Records in nearby Chicago. Recording as "Gary Shelton," he had a regional hit with "Kissin' At The Drive In" in 1958. Another Chicago hit that year was "The Trance" on the Regis label. His father's death in 1960 forced him to put his music career on hold temporarily, but the following year he changed his name to Troy Shondell and recorded "This Time" (written by Waylon Jennings and Chips Moman), which got to #6 nationally and sold a reported three million copies. Recorded during an April 1st snowstorm in Batavia, Illinois, it was initially released on tiny Goldcrest Records, before moving over to Liberty Records. Unfortunately, it was Troy's only top 75 record. Relocating to Nashville, he continued to work as a writer, producer and publishing agent. Kitty Kallen, best known for her 1954 hit, "Little Things Mean A Lot" (#1 for 9 weeks), died Thursday (January 7) at her home in Cuernavaca, Mexico. The Philadelphia native was 94. Born Katie Kallen in 1921, she started singing on the "Horn & Hardart's Children's Hour" on Philadelphia radio. That led to her own show and, by the time she was 15, a spot singing with Jan Savitt's big band. She later sang with Artie Shaw, Jack Teagarden, Harry James and Jimmy Dorsey before striking out on her own. From 1955 to 1959, Kitty lost her voice -- though only onstage and was confined to just recording. She charted 14 times solo between 1949 and 1963, including "The Chapel In The Moonlight" (#4 - 1954), "Aba Daba Honeymoon" with Richard Hayes (#9 - 1951) and "My Coloring Book" (#18 - 1963) before retiring in the mid-'60s. Kitty received a star on the Hollywood Walk of Fame in 1960 and was selected for the Hit Parade Hall of Fame in 2009. She appeared on Broadway in the original production of "Finian's Rainbow" in 1947. It's been very interesting reading about the Chicago - Peter Cetera Hall of Fame news. Besides Peter, I really hope Danny Seraphine gets to drum behind the guys again. Just based on everything I've read about his exit, I believe he was railroaded out of the band. It seems communication was the main culprit. Anyway, Ron Onesti wrote a nice piece about becoming a fan of Chicago and Robert Lamm. I remember the first time I heard "Saturday in the Park". I liked the song so much that I had to buy the "Chicago V" album. The Italian "mystery line" was clear to me right away. On the liner notes, the transcriber didn't know what Lamm was singing, so a "?" was printed in place of the lyric line. Robert told Ron that it was "Italian Gibberish", but I knew it was in reference to the first line of Julius LaRosa's hit, "Eh Cumpari". We had the 45 around the house for years. I played that one part of "Saturday in the Park" to my dad, but I think it moved along too fast for him, so he couldn't figure it out. The lyric basically translates (in Southern dialect), "Hey friend(s), I will play (or perform) for you." Lamm's line is a bit incomplete, but most of it's there. I first heard bassist / tenor vocalist, John Cowan, when he was with the Newgrass Revival. Sometime listen to his vocals on "Callin Baton Rouge" (not the later Garth Brooks recording). He was just featured on a PBS music program, the other night. What a set of pipes he possesses! He has one of those rare voices that automatically turns heads in a room. Since his days with "Newgrass", he's had his own band and been a touring member of The Doobie Brothers. With all respect to Jason Scheff, I always wondered what Cowan could have done as a member of Chicago, if he was at all interested. Thanks for your enthusiasm and support with the Rock and Roll HOF nomination and induction. Just wanted to share a quick video gem of Tom Petty and Prince playing "While My Guitar ... ". I was blown away by Prince, basically speechless! I knew he was a great musician but any doubt would be put to rest based on this on. The best cover I've ever heard. Enjoy! For Christmas FH Reader Scott Paton sent me a compilation disc of alternate versions of well-known hits performed by the artists who helped to make them famous. As is usually the case with these types of releases, what stayed in the can did so for a good reason ... it just didn't measure up to anything close to that artist's best performance of this material. One exception on this disc, however, belongs to one of my least-favorite songs ... which is why hearing it in such an early, stripped-down version made it so appealing. Give a listen as Otis Redding does an early run-through of his biggest hit "Dock Of The Baby". Forget the loud, corny seagulls tacked on to the beginning ... and realize that the guy at the end really needs to wet his whistle before doing another take ... and what you get in between is a very relaxed, comfortable feeling take on what's gone on to become a '60's classic. Otis is in fine voice and the whole groove of this record helps to drive it home. Great blog "Sunday Comments" ... so much good stuff. I disagree on the comments about Bobby Darin's participation in the PBS special on folk music He appeared very uncomfortable as he sang an out of character, for his persona, song and very faintly displayed the Peace Symbol at the end ... you could tell he was uncomfortable yet committed to expanding his 'song book' and growing his fan base. Great link to the Don McLean article, too. We Oldies aficionados are very proud of ability to recall all the great songs of our youth, some of the negative aspects of growing older like poor memory, repeating ourselves and going off track are mostly comments made by lesser people who are jealous of our standing in the community. Great Blog today, good stuff. I liked the Darin comments as well as the American Pie comments. We often get criticized for going off point but we 'older people' are sharp as ever. Loved the Bobby Darin discussion ... good that Chicago is finally getting recognized ... look, a bunny!!! Sharp as a tack, Merry New Year, and have a great week. Thanks Mrc Cuddy. Be back soon. Keep up the ????? work ! That being said, I want to leave you with my personal favorite. It's the lead-off track, "Aces Up Your Sleeve" which, for me, sets the tone of the whole LP. Dion's got his groove down ... and I'd love to see him perform live in a setting like House of Blues or B.B. King's performing these tracks because I believe the audience will eat 'em up. (Bring some CD's with you, Dion ... 'cause the fans will want to buy 'em on their way out the door!) Yeah, we'll still want to hear some of the hits ... but the spot you're in right now suits you well ... so enjoy it ... and let the public hear these songs.